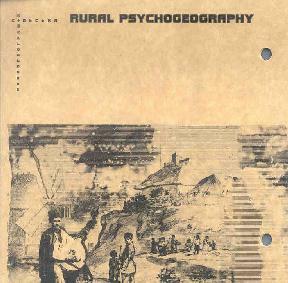 Various Artists - "Rural Psychogeography"
According to Wikipedia, psychogeography is “the study of specific effects of the geographical environment, consciously organised or not, on the emotions and behaviour of individuals”. Those who study psychogeography wander (sometimes obsessively, it is said) around any given environment, to experience it in new ways. They have developed unusual methodologies for doing this, such as following their nose by chasing after smells, or navigating the streets of one city using the map of another city. I’m not sure what specific systems the artists on Rural Psychogeography used, but this is environmental recordings of the purest variety, sometimes set to experimental electro-acoustic music, sometimes not. This is not the kind of environmental recordings featuring pleasant birds chirping or waves crashing, designed to lull and soothe the listener by floating around in the background along with some soft new-agey music. Nor is it harsh or unpleasant noise either. Sometimes it is just simply a recording taken of some acoustic environment. Avant-garde musician John Cage did a famous piece where he sat at a piano for four odd minutes and played nothing. The idea was to get the audienced to listen to the sounds around them, to fully experience their natural sonic surroundings. The pure environmental recordings on Rural Psychogeography have this effect. By removing the other senses from the landscape, one tends to focus on just the sounds, hearing the background noise of everyday life in a new way. I’m not sure if that was the goal of this album, but it is an interesting experience. Most of the pieces, however, do feature some form of music, most often abstract, minimalist electronic music, but occasionally acoustic sounds as well. It sounds like an old idea: marry environmental recordings with music. But the artists on Rural Psychogeography have somehow managed to make this old idea sound fresh. Though it’s by no means as groundbreaking as say, Brian Eno’s development of ambient music in the late 70’s and early 80’s, Rural Psychogeography does nonetheless draw you into its unique environment of sound. For more information you can visit the Nexsound web site at: http://www.nexsound.org. Contact via snail mail c/o Nexsound; PO Box 1739; Kharkov 61204; Ukraine.